Curiosity, NASA’s newest Mars rover, is slated to touch down on the surface of the Red Planet early Monday (Aug. 6), at 1:31 a.m. EDT. The rover is the heart of NASA’s $2.5-billion Mars Science Laboratory (MSL) mission, which will try to determine if Mars is, or ever was, capable of supporting microbial life. 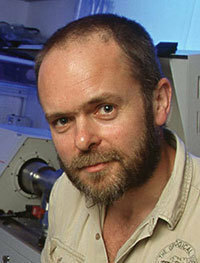 Clive Neal, a University of Notre Dame planetary geologist, views the mission as a critical one for NASA. 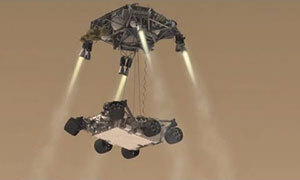 Curiosity was launched by NASA on Nov. 26, 2011. The six-wheeled rover is equipped with 10 science instruments and a wealth of high-tech camera gear. It will land beside Mount Sharp in the Gale Crater because scientists believe they will find water there. “The mission is well-equipped to look for organic molecules in a sequence of geology that has been defined from orbital data to be the most appropriate to preserve them, if they were ever present,” Neal said. “This is much better than the Viking landers of the 1970s, which did not have the orbital data to guide the landers to the most likely geology that would have preserved organic life. Neal is a member and former chair of NASA’s Lunar Exploration Analysis Group, which is responsible for analyzing scientific, technical, commercial and operational issues associated with lunar exploration. The group provides findings from these analyses to NASA through the NASA Advisory Council. He also is a member of NASA’s Lunar Science Institute, which is a select team of scientists tasked with growing the nation’s technical capabilities in lunar science and developing educational opportunities in space science. Originally published by William Gilroy at newsinfo.nd.edu on August 03, 2012.